Where Does Recent Attrition Leave the Huskers' Roster? Any time a coaching change happens, roster attrition can be expected. That attrition has happened gradually for the Huskers over the course of the last six weeks or so. Quarterback Patrick O’Brien kicked things off in mid-April, choosing to transfer out of the program after it became clear he wasn’t the right fit for Scott Frost’s offense. Fullback Ben Miles also chose to transfer after his position was all but eliminated while wide receiver Keyan Williams chose to seek a bigger role elsewhere as a graduate transfer. Center Michael Decker, whose 2017 season was cut short by an injury last year that also prevented him from participating in spring ball, chose to retire from football. Most recently, inside linebacker Andrew Ward announced that he will transfer as well. Reserve offensive lineman Bryan Brokop also changed his Twitter bio to read “Former Nebraska Football Player,” though he has since removed that line and nothing has been made official. Scott Frost’s first recruiting class in Lincoln boosted Nebraska’s scholarship total to 89, four over the limit of 85. The five confirmed departures drop that total to 84 and Brokop leaving would made it 83. However, Central Florida transfer Noah Vedral has been placed on scholarship after paying his own way for the spring semester because Central Florida declined to release him from his scholarship. Where does all this roster turnover leave Nebraska? Let’s take a look. Decker’s retirement has been the most significant loss for the Huskers thus far. He was the presumed starter heading into spring ball after coming on strong once he was plugged into the starting lineup. Decker started five games and helped pave the way for three of Nebraska’s top four rushing performances before an injury ended his season — and now his career — prematurely. This hurts not only because Decker was a good player, but also because Nebraska doesn’t have a true plug-and-play replacement for him. Cole Conrad, the former walk-on who opened the season as the starting center last season after starting at right tackle as a sophomore, is the only option with any kind of experience. 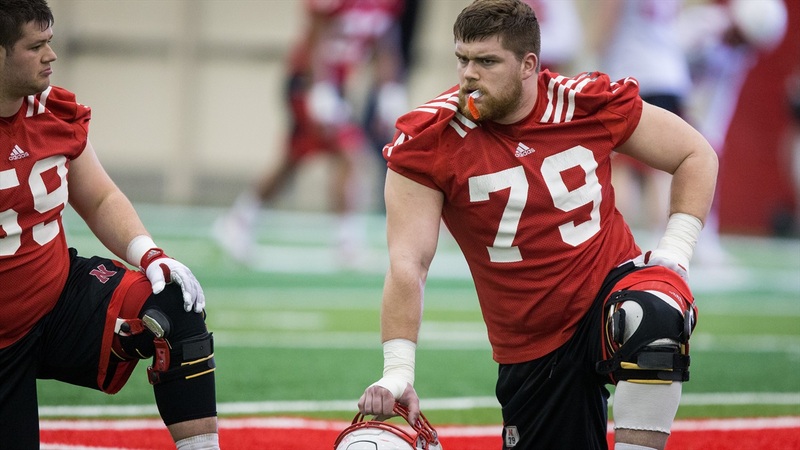 Redshirt freshman walk-on Hunter Miller was a pleasant surprise early in the spring with both Decker and Conrad on the shelf, but we didn’t hear his name quite as much near the end. True freshman Will Farniok, an early enrollee, very well might be the center of the future, but, listed at 260 pounds, can he really be the center of the present? Outside of those three, offensive line coach Greg Austin has also spent part of the spring cross-training several linemen, and that includes last year’s starting guards in Jerald Foster and Tanner Farmer. Farmer seems like a more likely candidate to slide over full-time. Decker’s departure sets up the center position to be one of the most important battles come fall camp. None of the other departures are likely to have the same long-lasting effects as Decker’s. O’Brien’s decision to transfer came as a surprise to very few as many expected him to be the odd man out in that quarterback room. Walk-on Andrew Bunch’s success only made that decision easier for O’Brien as last year’s backup slipped to the bottom of the depth chart in terms of practice reps. The quarterback room might not be quite as large as Frost may like, but they’ll be just fine without O’Brien as redshirt freshman Tristan Gebbia, true freshman Adrian Martinez, Bunch and Vedral — who will sit out this season per transfer rules — remain. Gebbia and Martinez were the favorites heading into camp and they remain so after O’Brien’s departure. Miles’ days were pretty much numbered as soon as running backs coach Ryan Held said that there is no fullback in their offense. Rather than sending the fullbacks to work with tight ends coach Sean Beckton with the idea of transitioning them into H-back types, they stuck with Held and trained as running backs. In the Red-White Spring Game, Miles logged four carries for 9 yards. He was a big get for the previous staff and likely would have had a solid career at Nebraska taking over for Luke McNitt as the starting fullback, but it wasn’t meant to be. His departure leaves a pair of walk-ons — senior Austin Rose and junior Austin Hemphill — as fullbacks still on the roster. Williams transferred to Nebraska to play for his dad, former wide receivers coach Keith Williams. He was in the discussion to start at the slot receiver position heading into last year, but a hamstring injury cost him a lot of time and JD Spielman, coming off a redshirt year, blossomed into a full-fledged star at that position. With a concentrated recruiting effort at the receiver position by the new staff, receiver went from one of Nebraska’s shallowest positions to one of its deepest. Buried on the depth chart, Williams made the difficult decision to transfer elsewhere for his final season. Spielman returns to build off of his freshman season and sophomore Tyjon Lindsey is also working some in the slot. The Huskers also have Stanley Morgan Jr., Jaevon McQuitty, Mike Williams, Justin McGriff, Miles Jones, Jaron Woodyard, Andre Hunt, Dominick Watt and Katerian Legrone as pass catchers on scholarship. Ward redshirted last year, learning behind the likes of Chris Webber, Dedrick Young and Mohamed Barry. Two of those three are back again this season and the coaches added another plug-and-play option in junior college transfer Will Honas. Add in highly thought-of sophomore Avery Roberts and Nebraska has a core four at inside linebacker that has really separated itself from the rest of the pack, according to inside linebackers coach Barrett Ruud. Ward was playing catch-up alongside the likes of fellow redshirt freshman Willie Hampton and walk-on Jacob Weinmaster. Listed at 6-foot-1 and 200 pounds, Ward is about 25 to 30 pounds lighter than the rest of the inside linebackers on scholarship. Once again, the fit wasn’t right, and once again, Nebraska has plenty of depth at that position. Finally, Brokop redshirted in 2016 and did not appear in a game in 2017. He did not appear particularly close to seeing the field. Nebraska still has 12 other linemen on scholarship plus incoming freshman Willie Canty who still has some work to do academically before making his way to Lincoln. Attrition happens with almost every coaching change, and in this case, it had to happen with Nebraska over signing with its 2018 recruiting class. However, the Huskers have cleared that threshold prior to fall camp and only one of the departures looks to be an impact player.